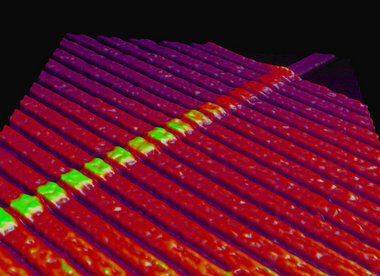 An image of a circuit with 17 memristors captured by an atomic force microscope. THE personal computer is vanishing. Computers once filled entire rooms, then sat in the closet, moved to our desks, and now nestle in our pockets. Soon, the computer may become invisible to us, hiding away in everyday objects. A Silicon Valley announcement last week hinted at the way computing technology will transform the world in the coming decade. Hewlett-Packard scientists said they had begun commercializing a Lilliputian switch that is a simpler — and potentially smaller — alternative to the transistor that has been the Valley’s basic building block for the last half-century. That means the number of 1’s and 0’s that can be stored on each microchip could continue to increase at an accelerating rate. As a consequence, each new generation of chip would continue to give designers of electronics the equivalent of a brand new canvas to paint on.